I must admit something here. When I heard that Peabody – who won the last Hay Hay It’s Donna Day with her splendid souffle – had chosen cheesecakes as her theme for this edition of HHDD, I let out a hefty sigh. 2) I don’t really love it. Don’t get me wrong. When it’s good, it’s really good. However, when it’s bad….it’s dismal. I like a very creamy, light texture and very few people get it right. People also tend to bog down cheesecake with chocolate and drizzles and sauces and bitties all over it. None for me, thanks. 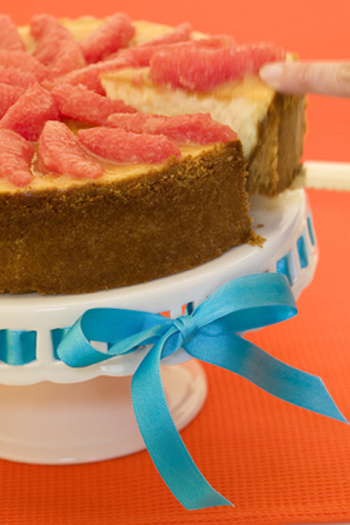 So when I sat down to decide which cheesecake I was going to make for my virgin cheesecake experience – yes…this was my first time – I kept going back to a recipe I saw in Bon Appetit at the beginning of the year – Ginger and Grapefruit Cheesecake. I saw the photo of it and it spoke to me. It had all of the elements that appeal to me in a dessert: clean flavors, light texture, and no cloying & superfluous garnishes. In general, I favor citrusy desserts. It was the best of all worlds…so I went for it. 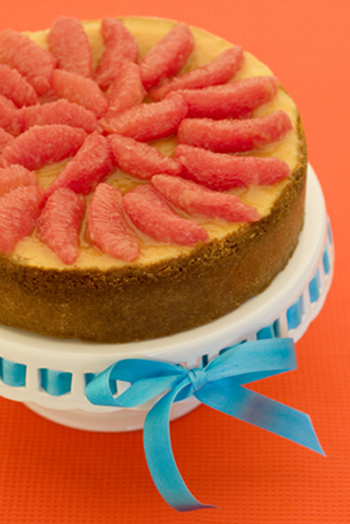 This Ginger and Grapefruit Cheesecake, originally published in the January issue of Bon Appetit, was really spectacular. Not only was it visually delightful, the taste was far better than I ever expected it to be. The ginger flavor is very pronounced, so it’s not for the ginger-faint-of-heart. The texture was spot on – insert me patting myself on the back here. It was not overly sweet…and the tang of the grapefruit was the perfect accompaniment to the sweetness and the zing of the ginger. The flavor combination was a huge hit – even with those who are more "traditionalists" when it comes to cheesecake tastes. The only change I would make would be to watch out for the amount of crumbs the recipe makes for the crust – I had too many and the back part of the crust was a little thick in some spots due to my need to use all of the crumbs. The recipe, which was from the January 2007 issue of Bon Appetit, can be found here – I’m not going to transcribe it because it is quite long & detailed and I would hate to miss something while doing so. Thanks to Tony Clark for being so easily wooed by cheesecake and for taking the lovely photo. It looks stunning, Tami – what a great way of participate! What a great photo! Did it taste like it look, gorgeous? That looks wonderful! There hasn’t even been a roundup yet, and I’m already bookmarking cheesecake recipes to try left and right. Looks fantastic, and I love the flavour combo! Sounds delicious Tammy. Thanks for joining us again. I am enamoured with grapefruit. I have one a day, but if you put in cheesecakes…then I will have 2…superb!